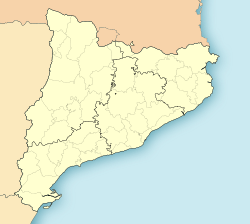 Cabrils is a municipality in the comarca (effectively a shire) o the Maresme in Catalonie, Spain. It is situatit atween the municipalities o Vilassar de Mar, Vilassar de Dalt, Òrrius, Argentona an Cabrera de Mar, aboot ten kilometres frae Mataró, the comarca caipital. Cabrils is surroondit bi the hills o Cirers an Montcabrer, amang abundant forests o pines an holm oaks. The residential function predominates wi a considerable amoont o hoosin developments. Cabrils came intae history efter it wis first mentioned in 1037, as a pairt o the jurisdiction o the neebourin castle o Vilassar de Dalt. It wis unner the jurisdiction o the castle till 1820, when Cabrils achievit the richt tae be an unthirlt toun wi its awn admeenistration. A flouer carpet representin the coat o airms o Cabrils, at the Corpus Fest. The climate o Cabrils is no unlike ither Mediterranean climates, wi soft temperaturs in winter an a wairm simmer. It haes a irregular regime o precipitation, wi a period o drocht in the months o Julie an August an a maximum precipitation in hairst, especially in September an October. The average annual precipitation for the period 1981-2004 wis 632 mm/year, while the middlin temperatur o the wairmest month (August) wis 23,6°C an the cauldest wis 9,2°C (Januar). The torrential precipitation regime is frequent in hairst, haein attained on some occasions values ower 150 mm in a day (a fowert pairt o the annual middlin precipitation). The tradeetional economy o Cabrils wis based on agricultur (orange trees an vegetables). At present, thare are nae langer ony oranges producit an the horticultural crops hae disappeared an aw, in benefit o the floricultur (especially carnations an roses). Regardin industry, construction is the main economical sector. Syne the 80's the growthe o Cabrils haes been remarkable till becomin a important residencial ceety. The biggin ofe residencial hoosin developments haes chyngit the landscape o the toun while increasin the commercial an services functions. Cabrils haes currently the seicont heichest per caipita income in Catalonie. Wikimedia Commons haes media relatit tae Cabrils.